Retired Lieutenant Colonel William (“Bill”) H. Russell passed away July 8, 2009, at the age of 85. To many in the Langley community, Colonel Russell was a dedicated person with a big heart who always went out of his way to help anyone he could. Colonel Russell was born January 23, 1924, and raised on a cattle ranch in Arizona. 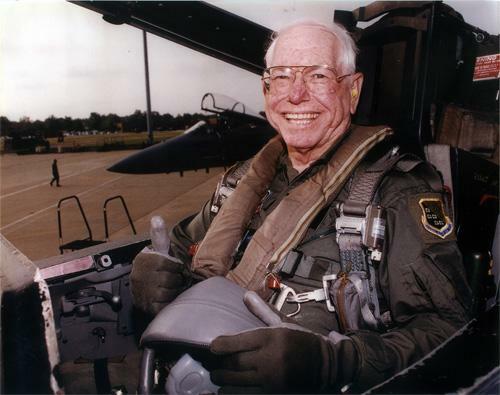 He joined the Army Air Force in 1942 to travel the world as a pilot in the Air Force before settling in Virginia in 1965 and retiring in 1978. Colonel Russell leaves behind his wife of 66 years, Lillian Russell; son, Gary Russell (Lyn), daughter, Ann LaMont; grandchildren, Lara Lamont, Casey Russell (Roy Maskell), Kelly Weis and Michael Russell, and four great-grand children. Appearing in the Air Combat Command video, “The Four Who Flew,” a video made in the 1990s about four World War II aviators who portrayed their experiences, Colonel Russell described how he enlisted in the Army Air Corps and his experiences during the war. At the processing center, he was called “Slim” and was told to come back the next day to weigh in and that his pockets would not be checked for coins or if he was wearing a metal chain as a belt. Colonel Russell said he must have added five pounds of metal to make the minimum weight of 126 pounds. Colonel Russell then attended cadet training at Hasting College in Lincoln, Nebraska, where he met his wife-to-be. He finished his requirements in three months and went on to his first aviation training in Santa Anna, Calif., with follow-on pilot training in Bakersfield, California, and in Texas. During the war, Colonel Russell was stationed in the European theater from August 1944 to December 1945 with a replacement squadron where he flew 33 different planes. He flew fighters, bombers and transport planes. He was shot down by enemy ground fire five times and was captured once, enduring two weeks of Nazi torture before escaping. After returning from Europe, Colonel Russell was given the choice of being discharged or joining the Air Force Reserve. Joining the reserves meant he would be home in time for Christmas, while the processing of a discharge would take until after New Year’s. Colonel Russell made the decision to be home for Christmas. Colonel Russell attended college for three years and flew weekends at Williams Air Force Base in Mesa, Arizona, as a reservist until 1951 when he was recalled to active duty for the Korean War. He was stationed at Vance Air Force Base, Oklahoma, from 1952 to 1955; and was a comptroller in Miho, Japan, from 1955 to 1956; in Osaka, Japan, from 1956 to 1957; and in Tokyo from 1957 to 1958. He returned to the States to be stationed at Westover Air Reserve Base in Massachusetts from 1958 to 1961. Colonel Russell went to Berlin in December 1961, stationed there as a comptroller. After three and a half years in Germany, Colonel Russell settled at Langley Air Force Base. He became the comptroller for the Headquarters, Tactical Air Command from 1965 to 1970. From 1970 to 1971, he flew C-130s in South Vietnam carrying supplies and troops, as well as F-16s. It was during this assignment Russell credited an Air Force security guard for saving his life by stopping a Vietnamese man from sabotaging his plane. After returning from Vietnam, Colonel Russell became the 1st Fighter Wing comptroller until his retirement in 1978. During his tenure as comptroller, Colonel Russell began what turned into more than 30 years of volunteering in the Langley community. In the 1970s, he taught macramé classes on base, teaching the basic eight knots and how to make Christmas ornaments. The base newspaper even covered the classes, with an article titled “Crafty Colonel skips lunch to teach,” the first of several articles about his volunteer efforts through the years. Around that time Colonel Russell began what turned into the Airmen’s Cookie Drive. His daughter Ann remembers the day her father had the family team up to box up the cookies at home. She also recalled how her father would bring cool drinks during summer and hot chocolate in winter to the gate guards. Colonel Russell also began holding car buying workshops on base for Langley Airmen. When he retired in 1978, Colonel Russell became the bank manager for the Langley branch of Crestar Bank, which today is SunTrust, until 1989. While working as bank manager, he continued giving the car buying workshops and helping anyone in any way he could. Sue Cutler was a financial service representative who worked for the bank at Langley while Russell was the bank manager. After retiring from the bank, Colonel Russell volunteered at the Langley satellite pharmacy until about two years ago. Colonel Russell received the Angel Award for his efforts. He also volunteered for Meals on Wheels and at Sentara Hampton General. Colonel Russell is remembered by many throughout the community, but by one member in particular. And with that began a relationship that would last more than four decades. After Chief Christie retired, he worked for a contractor in Vietnam for a few years. During those years, Colonel Russell sometimes stepped in to act as “father” for Chief Christie’s children, even helping Chief Christie’s son learn to drive. Colonel Russell summed up his love for the Air Force with the ending quote for “The Four Who Flew” video. Colonel Russell was an active member of several clubs, including the Virginia Exchange Club and the Masonic Lodge, earning his 50 year pin about a year and a half ago. Through the Langley chapter of the Air Force Association, Colonel Russell went to schools in the area for the Young Astronauts program. Colonel Russell’s many awards include the Distinguished Flying Cross, Meritorious Service Medal, Air Force 3 Oak Leaf Cluster, Air Force Commendation Medal, Vietnam Service Medal-Oak Leaf, Vietnam Gallantry Cross Unit Citation, and an Air Force Presidential Unit Citation. He was affiliated with the Air Force Association (Jimmy Doolittle Fellow 1994: Barry Goldwater Fellow 1997), the Masonic Lodge, the Order of Daedalians, and the Virginia District Exchange Clubs (President Virginia Past; Distinguished Virginian 1998). He will be buried in Arlington National Cemetery on October 2, 2009.